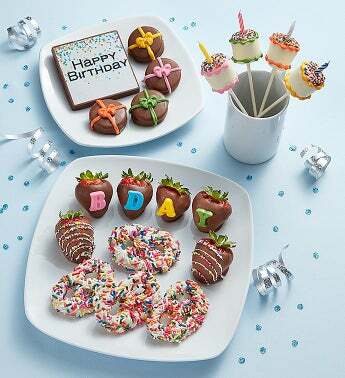 Our decadent birthday treats are like a celebration in every bite. 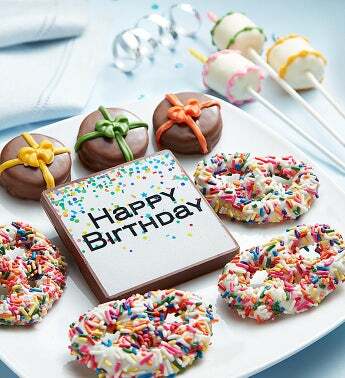 Start with a pair of crunchy pretzels dipped in birthday cake-flavored chocolate, add marshmallows and Oreos® hand-decorated to look like cakes and presents, then finish it off with a “Happy Birthday” placard that’s good enough to eat (you can… it’s chocolate!). We’ve even added real candles for wishing upon. What more could you wish for? If it’s delectable dipped and decorated strawberries, then you’re in luck... because you can add 6 of those as well!